Flashback 15 years I remember my self trying to design the logo for my business. You’ll agree that’s the most difficult project a designer has to do. Thousands of paper sheets went into the bin before finding the right concept, the one that really please us. Well, I must admit that it took a couple of weeks but the result was in fact, encouraging. 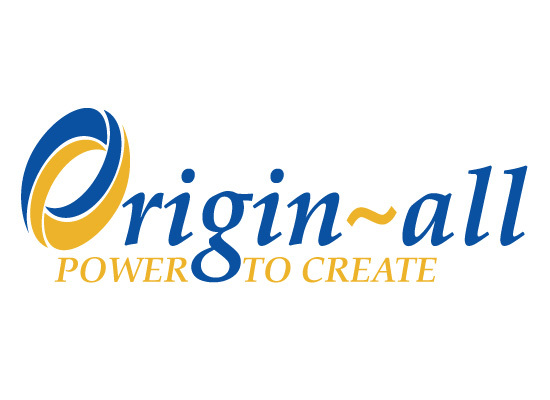 So, without further ado let me show you the first origin~all logo. Yes, the mandatory “swooshes”, the blue/orange color scheme and words slanted a bit to the right implying some motion and also the glorious tagline “Power to Create” in caps. That’s it, we have a winner! Althought the skills at the time were a bit rough. Three years later, in 2008, I decided to embrace the “logo 2.0” version (remember sphere and orb logos?) that added some depth, along with the cast shadows to the designs and in some cases a 3D kind of look. That was the perfect time to update the brand. That was a natural evolution, the shape was there, the “o” from origin. Decided to drop the tagline use only the word “design”… and I was searching for the right typeface. In all, I would say that it was very well executed. kudos for me! Ah, regarding the name of the business. I always love the double meaning in these instances; origin~all means that all my designs are made from origin, from scratch (no copy!) and so, they are completely original. That was it. Two years later (2010) time for a new remake. The signs of time, specially in the design field are mandatory and I need to be up-to-par with the trends and it was a logic thing to do. Improve even further, making the logo clean, recognisable and more powerful! I say that’s getting better with time, right? Shapes are more friendly, the typeface ties the icon very well and the color scheme was a open pallet. I always want my logo to stand out in every media and in every background and, this remodeling was no exception. But I wasn’t totally happy… and that’s a good thing! And that brings me to 2013! I kept the circle but I refined the “cutout” detail (~) moving it to where it divides the two words. Along with that revision I also find a matching typeface that is also customised for better integration.